Thanks to Nuffnang, I manage to catch the movie Hop on March 30, 2011. The story is about a bunny rabbit who's gonna be the one to take over her father as the Easter Bunny once he's old enough. But E.B. 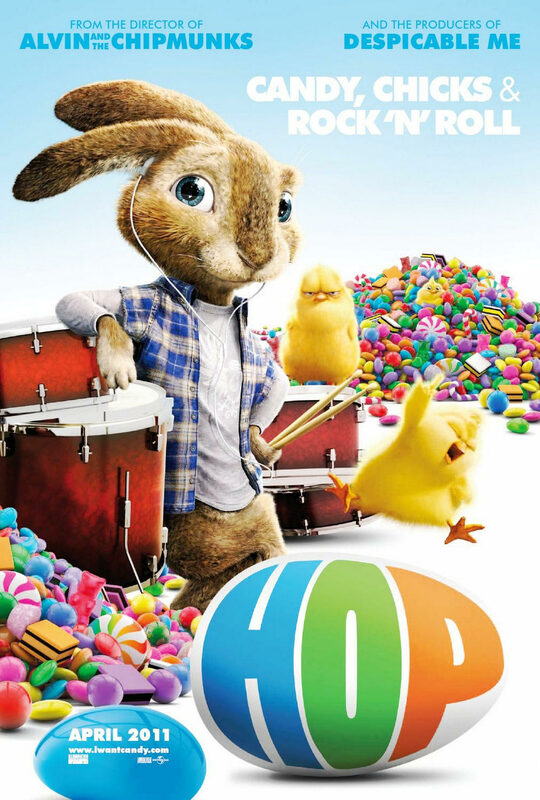 (who's the bunny is called, voiced by Russell Brand), always wanted to live a lifelong dream of becoming a drummer. On the day of his inauguration as the Easter Bunny, E.B. ran away from Easter Island and headed to Hollywood to pursue his dream. Whilst searching for a place to settle which wasn't looking very prospective at the moment, he got hit by a car driven by Fred O'Hare (James Marsden). Now Fred O'Hare is a guy who's jobless and was on his way to his sister's employer's house to house-sit since the sister didn't like dogs and hence passed the task to him and got him a job interview. Taking this opportunity, E.B. faked severe injury in order to crash at Fred's place which was Fred's sister's employer's house. Lost you yet? LOL. E.B. tend to annoy Fred a lot with his antics and keep messing things up for him. In addition to this, E.B. 's father, knowing E.B. has ran away, sent the Pink Berets which are the Easter Bunny's royal guards to search for E.B. Will E.B. get to live his dream as a drummer? Will Fred eventually get a job? This is pleasing to watch but I'm still looking for a movie that you can clearly say it's the movie of the year. For this movie, I rate 3.5 stars out of 5. I've stopped submitting entries for Nuffnang contest a while back due to low chances of getting. LOL.